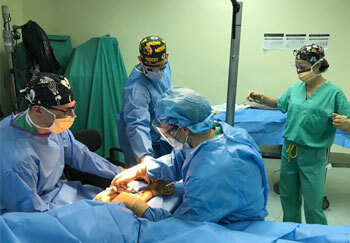 Since 2004, the Section of Global Health at Rush University Medical Center has organized surgical and medical service trips to Peralta, Dominican Republic. Over the past decade, the Rush Global Health program has sent a total of six teams per year to Peralta, comprised of 10-18 multi-disciplinary health care providers each. Historically, these providers were from medicine, pediatric, general and pediatric surgery, ENT, urology, urogynecology, anesthesia, nursing, and the medical school. The teams work for 7-10 days at a time, providing primary care, public health services, surgical intervention, and appropriate patient follow-up to this community. The rural farmland area of Peralta is home to 15,000-20,000 individuals with exceptionally limited health care access. As the population continues to expand, so does the need for medical care. For most citizens of Peralta, accessing regular medical attention is not a reality. Appropriate and timely surgical intervention is overwhelmingly scarce. 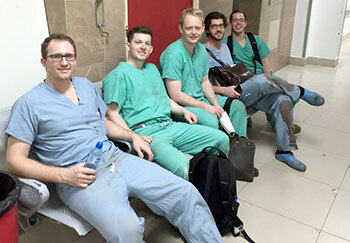 In 2013, Dr. William Slikker a fourth year orthopaedic surgery resident worked tirelessly to start a medical mission trip to include orthopaedic surgery. In 2014, a group of three residents and one attending performed surgeries and procedures for dozens of residents in Peralta. 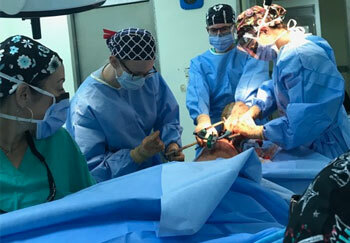 The success of the trip resulted in the formation of a strong relationship with Taiwan Hospital in the city of Azua paving the way for continued involvement from Rush orthopaedic surgery residents and attending faculty on an annual basis. 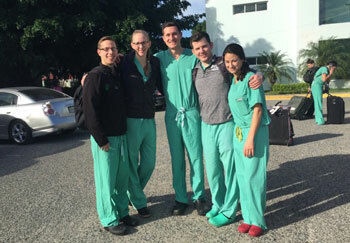 Sine 2014, the Department of Orthopaedic Surgery at Rush has sent a team of residents and attending physicians down to Peralta for one week each year to provide care to the medically underserved. Most recently, five residents and one attending surgeon, Dr. Monica Kogan, returned to Peralta in January 2016 to follow up on previous patients as well as provide comprehensive orthopaedic care to new patients. The team spent five days running two operating rooms until nearly midnight each night. 29 major orthopaedic surgeries and 45 orthopaedic procedures in total were performed without complications despite the lack of resources such as suction, major instruments, and electrocautery. Each year the team brings as many supplies so they can provide the best care they can to the population. Through our work in Peralta, the Department of Orthopaedic Surgery at Rush has fostered and developed lasting relationships with local surgeons, nurses, and medical staff. These selfless individuals are instrumental in carrying on the medical care for the population between our service trips. Our residents and faculty cherish the opportunity to work with these individuals, including Dr. Roa and Dr. Beltran, local Dominican orthopaedic surgeons, who have taught our surgeons new techniques for fracture care in resource-limited environments. The department has adopted a model that emphasizes collaboration and strong grassroots relationships with a hope to eventually develop a locally sustainable orthopaedic health care program. The Department of Orthopaedic Surgery looks forward to supporting and expanding our program in Peralta, Dominican Republic in the future.